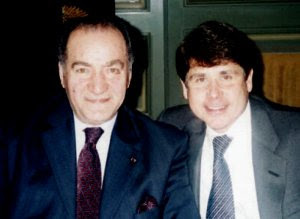 With Rezko on the ground there, the Auchi-Rezko combine created an Arab-American network linking Chicago and the Middle East in ways that brought financial support to two promising, Illinois politicians: Rod Blagojevich and Barack Obama. 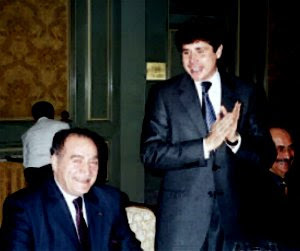 Rezko and Blagojevich now sit in federal prison convicted of corruption, but Barack Obama is the 44th President of the United States, thanks, in no small part, to early financial support from Nadhmi Auchi. Both are said to expect early pardons from Barack Obama. Meanwhile, Auchi is believed to have maintained ownership of significant assets in Chicago, where Rahm Emanuel, once Obama’s Chief of Staff, now serves as Mayor. Valerie Jarrett, a member of the Auchi-Rezko network, was part of both the finance arm of the operation and, having been born in Iran, also part of Auchi’s Chicago Arab-American coterie. Jarrett is now the principal advisor to the President and, reportedly, was recently discovered to have clandestinely negotiated with Iran on Obama’s behalf. Auchi is said to have spent many years serving as a protégé of British Intelligence, brokering its needs in the Middle East and beyond. That connection, and millions of dollars, enabled him to bring his problem-solving capabilities to the attention of U.S. policy makers at the time of the First Gulf War. The connections he developed during the war positioned him to become a key advisor to the Department of Defense (DoD) during the Reconstruction planning for Iraq. 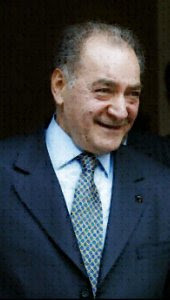 Auchi eventually leveraged his advisory role into becoming the central figure in Iraqi Reconstruction, which was plagued with corruption. I learned these facts while assigned by the DoD to track illegal arms sales in Iraq. In that role, I learned that Auchi appeared to cover his tracks using his intelligence and political connections. In 2008, the files which documented and confirmed what I had learned were transferred to the Chicago Office of United States Attorney Patrick Fitzgerald. Since then, that office has taken no action to pursue Auchi, or his network. Similarly, the Chicago media has demonstrated only occasional and cursory interest in Auchi’s role in Chicago politics. But then, Chicago is accustomed to accepting such skulduggery, seeing as it's the home of Al Capone and the Daley Machine, for starters. Nadhmi Auchi has gambled very successfully on his investments -- questionable or not -- around the world. Has Nadhmi Auchi gotten a good return on his investments in Chicago and D.C.? It could be said that Auchi has considerable sway over Chicago City Hall and the White House. My guess is that his aim is to make a lot more money and to influence policy. Don’t bet against his ability to do both over the next four years. John A. Shaw, a former senior official of the Defense, State, and Commerce departments, served on several White House staffs. He is a specialist in international technology transfer and arms sales, and in the economic development of the Middle East. Did you not know Valerie Jarrett was the managing executive for Paul Volker during his official role of Principle Investigator for the official UN commission appointed to uncover the corruption and fraud suspected in the UN Oil For Food Programme? Did you not know that Auchi-dominated BNP Parabas enjoyed the involvement of Jacques Chirac? Did you know that googling wikileaks exposed documents claimed as evidence of 8 major stories had been quashed or censored to protect Obama, Auchi and cohort interests? Build your search from that sentence. It was easily found. Did you not know that BNP Parabas enjoyed a patronage monopoly granted by Kofi Annan as the only official international settlements bank for the UN Oil For Food Programme vouchers? These vouchers spread round the world could only be formally redeemed via the official monopoly granted to BNP Parabas. Did you ever consider the possibility of the world's largest international criminal syndicate that could be operating behind the veil of the multi-nation, transnational Socialist International and its official affiliate, the Democratic Socialists of America? Did you know the relationships between Scytl and the murdered founder who created the software code so elections could be liberated from fraud; the ownership of Scytl by George Soros and the contracts and licensing involving Obama? Or the relationships between Scytl and Auchi? Have you looked into the alleging links that tie Scytl to Chicago to Rezko to Auchi to Rothchild to Khashoggi to Obama to BCCI? Chicago and the dark clouds lawlessness some fear roils from the underculture of CBOT/CME is the malignancy in metastasis destroying the American nation. Washington D. C. is merely one of the diseased organs being rendered to worthless, lifeless protoplasm in the final fungal bloom of decay. Wall Street is but the morgue, selling off the remaining organs and bundling body parts to optimize selling to the highest bidder. If we indeed face an transnational criminal hegemony expanding their control of infiltrated national governments, we should also admit there is nothing new here. This was the same reality faced by founding generation of America in 1776. Today, all roads lead to Chicago; and from there, to everywhere but the American people. Today it is the Americans who have been fattened up, dumbed down; now being led to slaughter. And for the same old reason by the usual suspects: To be rendered into "a greater good" in the name of Social Justice. The nearly 2,000 episodes of serialized murder in Chicago during the Obama Presidency is but a metaphor for the nation. Moreover, they are the story of murder-by-neglect in Benghazi foretold. In the era of Obama, we are all Christopher Stevens. Anonymous , wow what a lot of powerful information you posted , thank you for being a patriot ! One other piece to the Auchi puzzle...putting ISIL in context and understanding its creation. Auchil was not only Saddam's Oil for Food bagman but a fellow BA'THIST and International Arms Dealer ...Auchi was arrested and put on trial in the 60's for his activities. Since that time Saddam and Auchi worked closely together. AUCHI is the international arms dealer who supplied Saddam's Army ..The same army is who armed and created ISIS or as Obama prefers to say ISIL because the Levant is about controlling certain parts of Syrria and Iraq ...and ISRAEL. The Levant is the Ba'atists goal to reunite lands divided under Sykes Picot including Israel for the ISLAMIC STATE. That is exactly the goal of the Ba'athists, Auchi and OBAMA. We know that Saddam Hussein's army trained and armed ISIS. AUCHI and OBAMA were behind the creation of ISIS, ISIL is IS...They are a Ba'thist construct. Behind the green curtain you will find OBAMA and Auchi. Understand the reason OBAMA refuses to destroy IS...And the reason he lies about his orders to destroy IS which has now been well documented.